← Sakura Matsuri Saturday, April 29–Sunday, April 30, 2017 | 10 a.m.–6 p.m.
Too Much Monkey Business? : Japanese Authors at Baruch College! 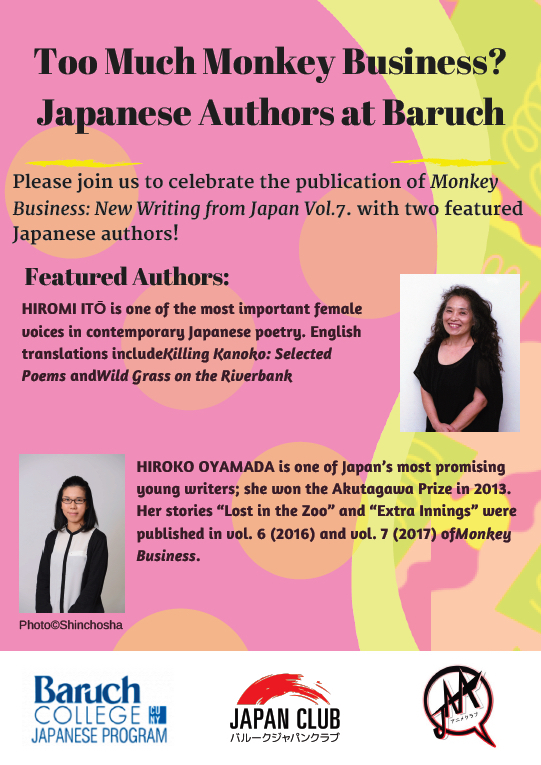 The Japanese Program at Baruch College welcomes two contemporary Japanese authors, along with the “usual suspects” from the “Monkey Business, International.” Please join us to celebrate the publication of Monkey Business: New Writing from Japan Vol.7. HIROMI ITŌ is one of the most important female voices in contemporary Japanese poetry. English translations include Killing Kanoko: Selected Poems by Hiromi Ito and Wild Grass on the Riverbank, both translated by Jeffrey Angles and published by Action Books. HIROKO OYAMADA is one of Japan’s most promising young writers; she won the Akutagawa Prize in 2013. Her stories “Lost in the Zoo” and “Extra Innings” were translated by David Boyd and published in vol. 6 (2016) and vol. 7 (2017) of Monkey Business. The venue is located in the The William and Anita Newman Vertical Campus: “B” on the map below. 1 Response to Too Much Monkey Business? : Japanese Authors at Baruch College!